We arrived back in Ghana last night after a very loooong evening due to some flight problems and consequently everyone eating some questionable airport food that is not boding well. But alas, we made it and finally went to the market I have been anxiously waiting. Getting a Bolga basket in Ghana has been at the top of my Travel Checklist for a while now. 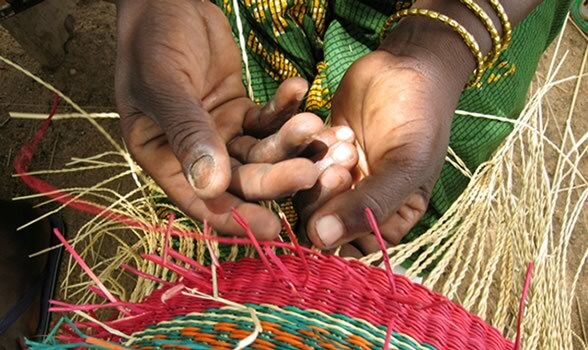 Bolga baskets get their name from the area in Ghana in which they are made, Bolgatanga, in the upper east region. The baskets are hand-woven, commonly using a checkerboard pattern or triangular pattern with dyed colorful straw. If you bought a medium large basket in Bolgatanga, it would cost about $2USD. I paid $13, mostly because I was too tired to dicker anymore. Anyways, these baskets are incredibly durable because of their thick weaving and leather handle. They also bend or collapse to be more compact when traveling or packing in a suitcase. I bought two, one for the living room as a catch-all and the other by the back door for mittens and scarves.